i've been wanting to make these forever, well just for a few months actually and i finally got around to making them yesterday. i think these are better than any school picture up on the wall could ever be. i think i'll make one for each kid every january. i bought the frames one at a time when i went to walmart every week, they were $3 each (not bad) although i really wanted the oval ones but they were $8 each. the mattes were white so i thought i would spruce them up with some paint. i talked about a tutorial that i sort of used the method in this post here but i just did the magic wand around the kid's heads (so that the background was "cut away" and then traced it onto white paper from the computer screen, then i colored it in with a permanent marker and cut it out... a little wonky yes but it works and i thought it turned out good. next year i'll try paint but that just sounds harder to do! i have SO wanted to do these. they seem hard. i guess everything seems hard to me. did you blow up a photo? those are fantastic, where did you learn to make them? and where can i learn? Very cute! 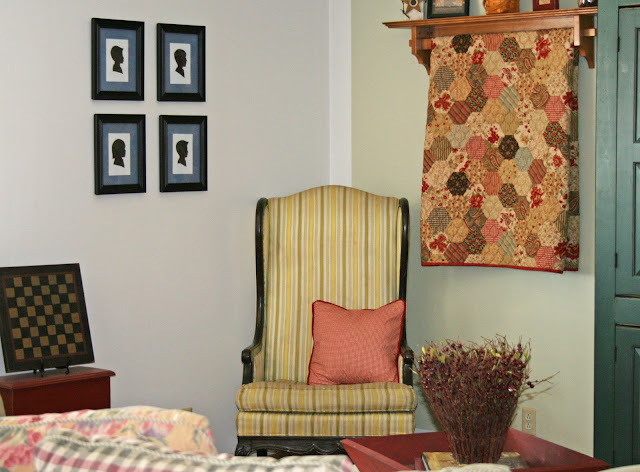 I LOVE the look of silhouettes- I have plans to make some of my own for my entry way- above a coat hook for each of us. What technique did you use to make yours? I have been trying to find the best/easiest tutorial out there. yeah i think everyone has the same question...how'd you do this? we'll need a tutorial! btw i've now seen twilight three times so i think i'm pretty hooked. I'm currently working on these out of fabric but can't get my little girls to look right. What's your method? I took profile pics and blew them up. Those are adorable, great job! 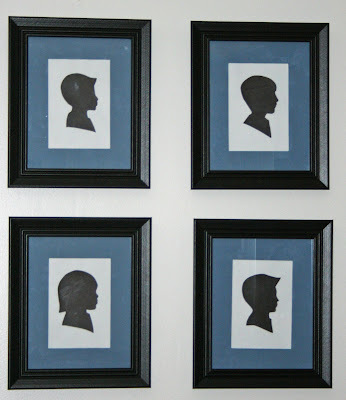 I have always wanted to make silhouettes of my children but have never attempted it, maybe it's time. but i just did the magic wand around the kid's heads (so that the background was "cut away" and then traced it onto white paper from the computer screen, then i colored it in with a permanent marker and cut it out... a little wonky yes but it works and i thought it turned out good. next year i'll try paint but that just sounds harder to do! You are funny. I was actually doing those for Valentines gift for myself, but have wondered if I could do it? Yours look great and I have confidence, yes I do. Hi there! I'm following Mr. Linky from the Inspired room. Your project looks really great! What a wonderful way to capture memories. I love those. I have one of my daughter hanging on our wall. It's my favorite. Mine is lifesized though. We traced her shadow and cut it out of black paper. Quick and easy and soooo cute! Hey! I have lots of different blue paint if you decide you still want it lighter. oh vanessa they are perfect!!! the blue brings out the soft blue in your quilt. i hope your pheobe voice goes away...along with the snot...before jake gets home!!! Those look wonderful Vanessa! I'm never short of totally impressed with your talents. I love the throw! Maybe I'll have to scour the internet and try to find a panel. :) I see you still have your checkerboard! I remember that from so many years ago. I love the sillouette craze! I think the color is nice, then again blue is one of my favorites. When I was in 1st grade our teacher had us make the silouhettes like this and my parents still have it. They are timeless! I agree, much better than a school picture. I like the blue. It brings out the blue in the quilt that I hadn't noticed before. Very nice project. Hey Vanessa! I do remember you of course. I love the blog, but you make me depressed. I hardly do anything anymore. I find that I'm not nice to my kids when I'm all wrapped up in a project. Five is just too many. I need to ease back into it. You depress and inspire me. Keep in touch. I'll add your blog to mine. Have a good one. What a great idea to do one each January. You will treasure those forever!!! Very nice! They are lovely on your wall. Thanks for being my every day inspiration to tackle more projects and make things beautiful (or attempt to at least...) You are amazing! Okay so obviously I am not the only one who wants to know...HOW DID YOU MAKE THIS? They are darling and yes a thousand times better than school pictures on the wall. So spill the beans girl- how did you do it? So darling! And I like the blue. That is so cute! I love those. 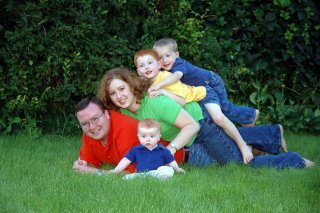 I've seen them in blogland and was thinking of doing 4 of my kids. Let's see if I actually do it, lol. Your blog is so fun to visit. Those turned out so nice! Actually, I love the rectangle frames, and you can't beat $3! They look great! I'm so glad that your GI Joe Husband is coming home soon!!! Great stuff, all of it! The silhouettes, the decorating, the stippling, the moda hexagon quilt (which you already know I'm totally coveting). YOU are one talented mama! I am home sick from church and found your blog from the November list on The Farm Chicks.s I just wanted to say you have made my eyes feel good today! I am just drooling over your decorating. I want to make my first quilt this year so am looking at yours and colors and thinking I am gong to do this. I wish I had a "Valentine Quilt" but am not even going to attemp it in a couple of weeks! Just wanted you to know that the quilt fabric is called "cheater cloth" and has been around for over 150 years. They are great, aren't they?